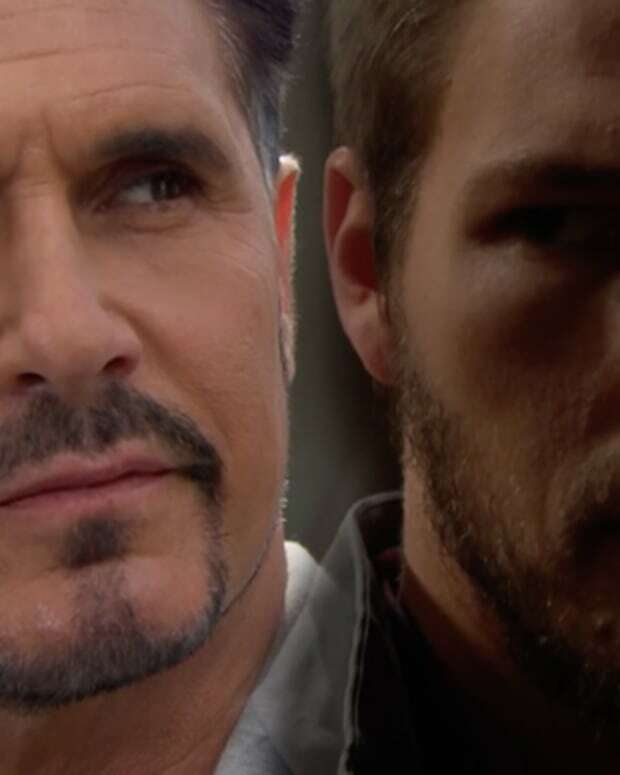 "Delete the recording" is the phrase du jour during the open mic conversation between Liam, Bill, Steffy, and Wyatt. Bill is touched by Wyatt&apos;s call for "family". Creepy RJ, Ridge, Maya, and Rick have moved Brooke back in to her house, with cardboard boxes. Wyatt asks Liam if he ever made a mistake. Wyatt shifts the conversation to Liam deleting the recording so they can put the family back together. Liam denies the request and Bill hangs up on them. Steffy reminds Liam of the last time they turned their backs on family (remember Eric and Quinn?). Liam reminds her he takes his commitment to their family&apos;s future seriously. Wyatt comes to see Liam. He questions if Bill trusting and loving him was a mistake. Liam wonders where Wyatt&apos;s moral compass lands. Wyatt backtracks and says Bill was wrong, but...people aren&apos;t disposable. Wyatt tells Liam he&apos;s on a quest for purity, but he&apos;s as dirty as everyone else. Steffy goes back to Bill&apos;s. She claims that she tried to sway Liam. Bill appreciates her efforts. He thinks he owes her something for not turning her back on him. Brooke tells her family she loves them. They all agree that life wasn&apos;t the same when she wasn&apos;t the center of their circle. Ridge asks for the cardboard boxes they used. She wonders if he&apos;s moving again. He tells her he&apos;s at the loft, but it&apos;s not home to him. He asks how he can help her be happy again. Bill whines that he can&apos;t be sad and upset around someone else. Steffy asks when the last time he pulled his hog out...OH sorry...put his hog on the road. She grabs a helmet and leads him out the door. Wyatt admits that he felt second to Liam. Liam explains that he&apos;s helping someone that was always put down for no reason. Wyatt brings up Sally&apos;s not-so-clean-past before Liam pulls out the big gun. OH sorry...did it again. Liam tells a shocked Wyatt that Bill engineered Caroline&apos;s impending death to lure shirtless Thomas back to his family. Wyatt concedes Liam is right about Bill, but claims his blackmail is as bad as arson. Liam counters that Wyatt is just afraid to stand up to Bill so he is content to be his "mini-me". He asks if Wyatt wants to be a part of a better Spencer Publications. After the hog ride, Bill agrees he feels better, but it didn&apos;t solve anything. Steffy says she will always be his friend.